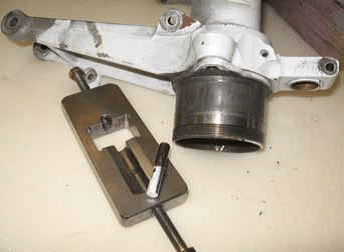 210 Nose Gear Lower Trunnion Replacement | Tennessee Aircraft Services, Inc.
Cessna’s SEB94-19 for the 210, (1967 and on), nose gear trunnion inspection and replacement doesn’t get a lot of press to the point that most mechanics/ owners are unaware the service bulletin exists. The inspection phase calls for eddie current tests for cracks which few small shops have the equipment to do. If cracks are found, the nose gear is removed from the plane to facilitate replacement of the cracked trunnion. Disassembly of the gear requires some field fabricated tools that shops are resistant to produce for a small volume job. Recently, I had reason to fabricate a new set of tooling for this service bulletin and thought I would show you how it is used. The Accomplishment Instructions section of the service bulletin does a good job describing most of the trunnion replacement details but could use some elaboration of the trunnion and barrel disassembly process. Figure 1 sheet 2 of the service bulletin shows a breakdown of the nose gear assembly and points out the primary inspection area. 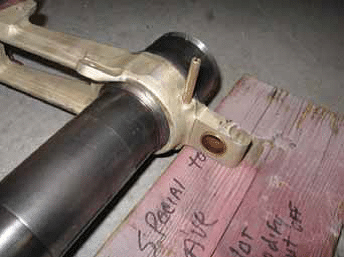 Figure 2 shows the special fixtures that must be fabricated to separate the upper and lower trunnion from the barrel. The lower trunnion has an interference fit on the barrel, and the upper trunnion has a close tolerance fit. This means you’ll have to heat the whole assembly close to 300 degrees F to press the parts off without scoring the mating surfaces. Before you heat this mass past water boiling temps, you should make a dry run with the fixture in the press. Mostly, be sure you have a really good pair of welders’ gloves so you can handle the assembly without being in a hurry. The press doesn’t need to be anything fancy or high strength. As you can see the photos, I have about the cheapest and simplest press money can buy. It does a great job. If your kiln is not large enough to hold this entire assembly, I suggest using the oven at “Moms” house. (Mom is more willing to let me put airplane parts in the kitchen oven than my wife is) Never trust the temperature selection on a typical home oven, always use an independent temperature indicator. The service bulletin calls for a maximum of 300 degrees F for no more than 20 minutes. Home ovens will often overshoot the selected temperature, so I select 250 degrees to be safe. This is hot enough to expand the aluminum trunnions and still leave a safety margin to ensure they overheat, weakening the aluminum castings. You have few minutes of working time, so be more careful than hurried. Usually, the press operation is smooth and uneventful. 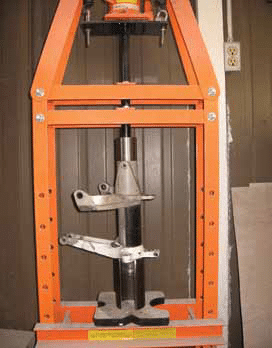 For a secure setup in the press, it is important to remember that less is more; the fewer support pieces you have the more stable the operation. I made a support piece specifically to hold the assembly in the press and give space for the barrel to eject from the trunnions. After everything is apart and cooled, you get to see how much corrosion needs to be removed. The top portion of the upper trunnion does not fit very tight against the steel barrel, causing a gap between the two parts. This results in an unfortunate storage place for water. 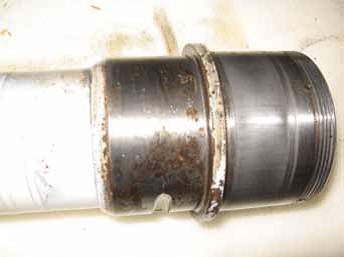 It is likely that a lot of work will be required to remove corrosion from the inside bore of the upper trunnion. Don’t be surprised if your mechanic charges a bit extra to take care of this clean up operation. 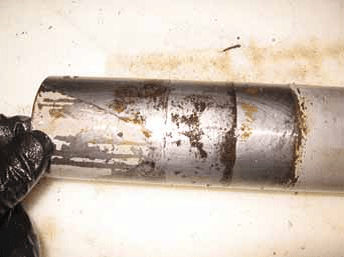 When Cessna figured the time to do this job, they were using new parts and could not anticipate how much time would be required to remove corrosion. 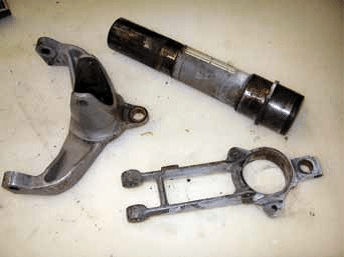 The parts must be inspected after corrosion removal to ensure sufficient material remains on the reused parts to maintain the appropriate fit. The service bulletin calls for a non-chromate epoxy primer on the barrel prior to reassembly. Be sure all rust is removed from the steel barrel before priming. To help prevent future corrosion problems on the unpainted machined mating surfaces, I suggest a film of Boeshield or Dinitrol AV-8 be applied just before assembly. After assembly and final painting, I would also suggest spraying a bit of one of these in the thin area between the upper trunnion and the barrel for added moisture displacement. 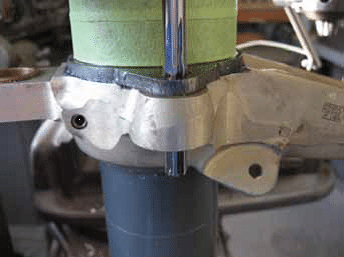 The service bulletin states to assemble the side braces with upper and new lower trunnion and press them on the barrel as an assembly. I have found this to be cumbersome and unnecessary. The lower trunnion is aligned with a steel roll pin and the upper trunnion with an AN5 bolt, so they can only locate in one position. The steel barrel is cooled in the freezer for a while and the two trunnions get warmed up back in “Mom’s” oven. The lower trunnion must be installed first and is the tighter fit of the two. A ¼” diameter punch, bolt, pin, or similar tool is required at this point to help rotational alignment, using the roll pin hole. A few taps on the trunnion with a soft mallet will help to get the alignment to the point where the alignment tool will slide in easily from either side. It is much more precise to make this alignment by looking through the roll pin hole and adjusting until it appears as a smooth tube. Driving the lower trunnion in place and getting it in perfect alignment should take no more than 20 seconds. A new roll pin should now be driven in place. By now the barrel has warmed and expanded significantly. The upper trunnion is just a close tolerance fit so you still have plenty of working tolerance to get it in place. In the top of the upper trunnion there are two 5/16″ diameter bolt holes that will be used for final alignment with the steel barrel. 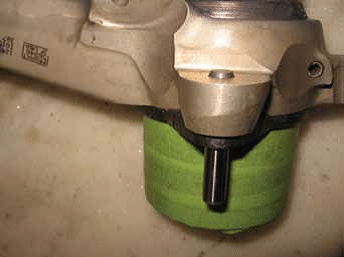 Drive the upper trunnion in place until the two holes closely align; then use a 5/16″ diameter punch, bolt, pin, or similar tool to perfect the alignment. You will need to alternate the alignment tool between the two holes until the tool fits equally well in either. The most common issue with this entire process is getting the new steering pin hole drilled straight. Anytime after the new lower trunnion and roll pin have been installed, the steering pin hole can be drilled. I place the assembly upside down on the table of the vertical end mill and clamp it in place. It must be aligned vertically but also laterally so the new hole matches the existing hole in the steel “ear” on the barrel. A centering bit is chucked in the mill for the centering process. Then the final drill bit is chucked to drill the hole. 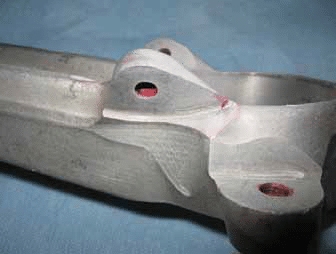 Cessna calls for a 0.3119″ reamer to finish the hole. You won’t find this dimension in any standard drill bit so you’ll use a smaller drill and work your way up to the reamer. I drill the initial hole with a 19/64″ precision drill bit which leaves about 0.015″ material to remove with the reamer. It will be somewhat less than 0.015″ because typical drill bits make slightly larger holes than their labeling. The service bulletin calls for a final ream of 0.3119″, plus or minus 0.0005″. 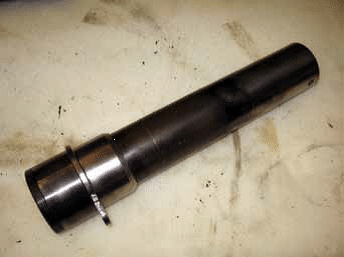 I use a 0.3115″ reamer to be sure the steering pin fits tight and leaves enough material for possible future reaming. The steering limit dowel pin is pressed into place next, with just thebeveled portion showing on top of the lower trunnion. Finally, the side braces are reinstalled, and the whole assembly is ready for final painting. I don’t see an urgent need for everyone to have their lower trunnion inspected by eddy current non destructive testing per the service bulletin. 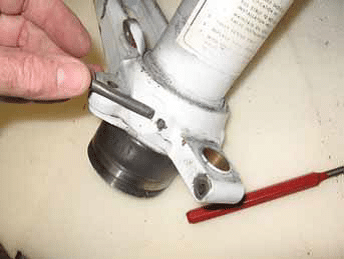 If your steering limit pin is intact, I would suggest you do a dye penetrant inspection of the lower trunnion at your next scheduled aircraft annual inspection event. 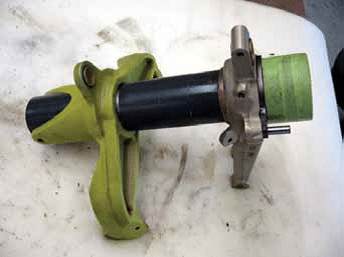 If your steering limit pin has been sheared off, I recommend you at least do a dye penetrant inspection of the lower trunnion before another tow motor is connected to your nose gear. Dye penetrant check showing crack in trunnion. 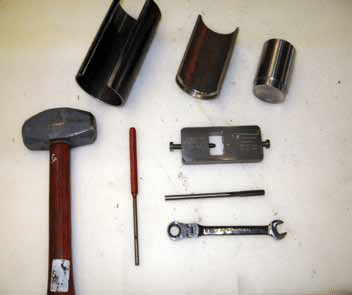 to mount assembly in press (top left), steering pin removal tool and accompanying wrench, punch to remove roll pin, and the obligatory hammer. The trunnion assembly, sans side braces, before the disassembly begins. 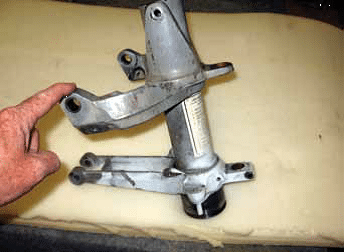 Step one – steering pin removal. Step two – roll pin driven out. The three main parts after disassembly. exceeded 10% of the barrel thickness. trunnion was and the “notch” for the roll pin. aligned for easy installation of the roll pin. trapped in the gap between the barrel and the upper trunnion. machine getting the final ream to size for the steering pin hole.